April 2019 brings a unique event for the RF Generation Shmup Club - the only shoot-em-up from developer and publisher Squaresoft! Known far more for their role-playing games, particularly the mammoth Final Fantasy series, Squaresoft ventured into a few new genres during the early-mid PlayStation era. In the fighting game genre, they released Ehrgeiz: God Bless the Ring, and they also published Brave Fencer Musashi, an action game. Despite still being an RPG, they also dipped their toe in the "survival horror" genre waters with the excellent Parasite Eve as well. However, one genre they hadn't explored up to that point was shooting games. They finally dove in, and ended up making one of the more highly lauded genre pieces on the system, the mighty Einhänder! Strap into the cockpit of the Einhänder, an advanced spaceship, to take on the Earth regime, as you fight for the survival of the moon colony. After the events of the First Moon War, much of the Earth was left destroyed. Now, in the Second Moon War, you're sent to Earth in a single fighter craft to destroy as many defense resources as you can, so that residents of the Moon can get back to Earth to gather valuable resources. Do you have what it takes to fight off hordes of Earth drones and military fighters? Join the RF Generation Shmup Club in April, and test your mettle against Earth, in this horizontal scrolling, PlayStation shooting game classic. Yup, I'm in for this one. Hey hey, glad to have you back in the game! So since I’m new round these parts...what are the rules for console titles I do not own or have hardware. Is emulating allowed in participating in the shmup club? Cause I don’t have einhander. The overwhelming trait of a leader is identifying pathways over, around, through and under all barriers presented. Welcome to the squad, Crabby! @coin_tengoku - as a collector site, we pride ourselves on our collections, and most participants will probably already own the game, but given how expensive it is now, emulating is fine for playing. I would say just play it legit, in that you don’t enable any cheats or trainers that an emulator might have available. I would also say that there are also ways to play it on original hardware that would give you a good approximation of the experience, just FYI. But I don’t have an issue with it otherwise. We have had some folks playing the arcade versions in MAME, while some of us play the available arcade ports. A good example is when we played 1942. A couple members played it in MAME, while I focused on the Saturn port, and dabbled with it on Xbox and PSP in Capcom compilations. Thanks. Only thing I have is What really counts...that is the Sega Genesis!...everything else is Steam or emulation. I will definitely preface my activity when posting so everyone knows I’m emulating if I am. And for sure the Legit way with no cheating. Glad to have you in for a 2nd month in a row! I'll join in on this one. See how rusty I am since my review a few months back. Awesomesauce! Happy to have you in the mix. Been playing this game the last couple days, and I forgot how rusty I am! One thing that throws me off is that the boss AI will adapt to what you do, and sometimes they change up the order of their attacks, or the pattern that they use. As such, they can be a little unpredictable. The 2nd stage mid-boss is a good example, and that often gives me trouble. Same for the Stage 3 mid-boss, that 4-legged spider robot monstrosity. That thing gets me, and I have a hard time adapting to it, for some reason. I'm hoping to get more of a rhythm for it, though, and find a way to get further on a single credit. Right now, I'm just credit feeding to see more of the game, and get to where I can learn the patterns more specifically. 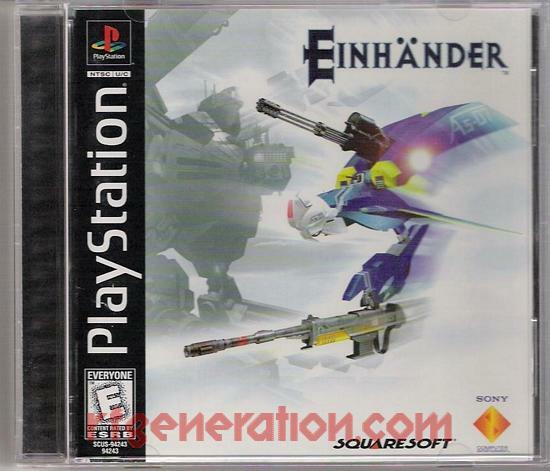 Einhander is one of those games I've always wanted to dig in and play, but it tends to go forgotten or falls by the wayside to something else. I usually play more for survival and shooting for 1CC's, so I suspect the scoring mechanics with the multiplier bar will give me some trouble haha. It feels like that definitely favors being very aggressive.